I hold fond memories of Halloween from when I was younger. Each year, my parents would take my brother and I to our respective scout and brownie parties, bob apples, carve pumpkins, the lot! I always dressed as a witch with an obligatory eyebrow pencil mole on my cheek and my mum's lipstick. 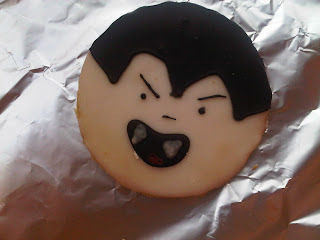 This year, I decided to do some Halloween cakes. 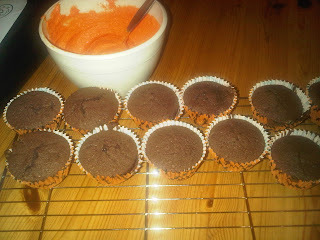 I had them planned for weeks, I was to have chocolate cupcakes with a wickedly orange coloured swirl of icing. Unfortunately, I decided at the last minute to turn them into pumpkins, which didn't turn out brilliantly. My chocolate icing solidified, causing me to have to use white icing to paint the unconvincingly scary faces on. As sad as it seems, the failure of these cupcakes played on my mind all week. 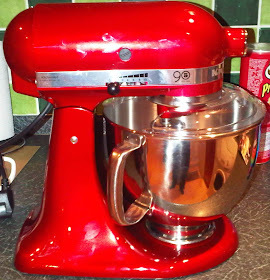 Eventually, I forced myself to start my Halloween bakes from scratch. 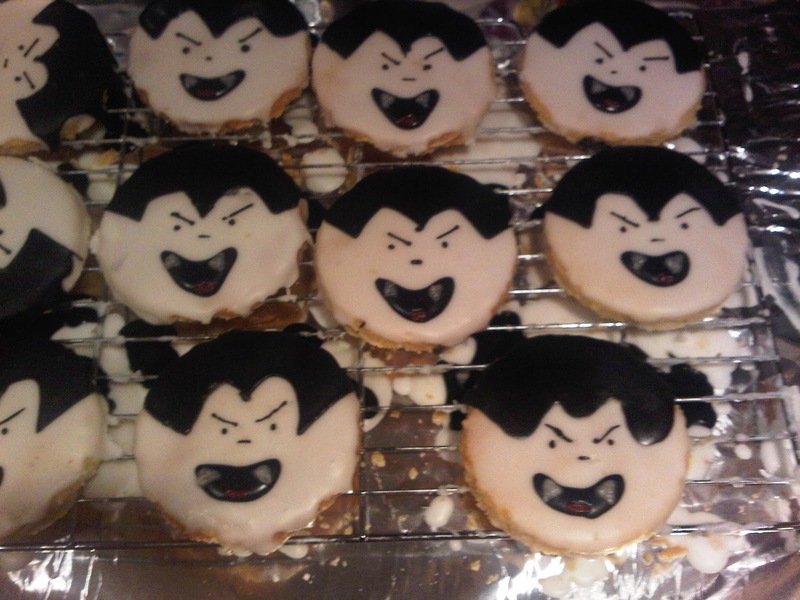 I got the idea of Dracula cupcakes from the Wilton website and used my regular Vanilla Cookie recipe. I am really proud of myself with these, they taste and look great. They could even be a bit spooky! I think your cupcakes look really cute! 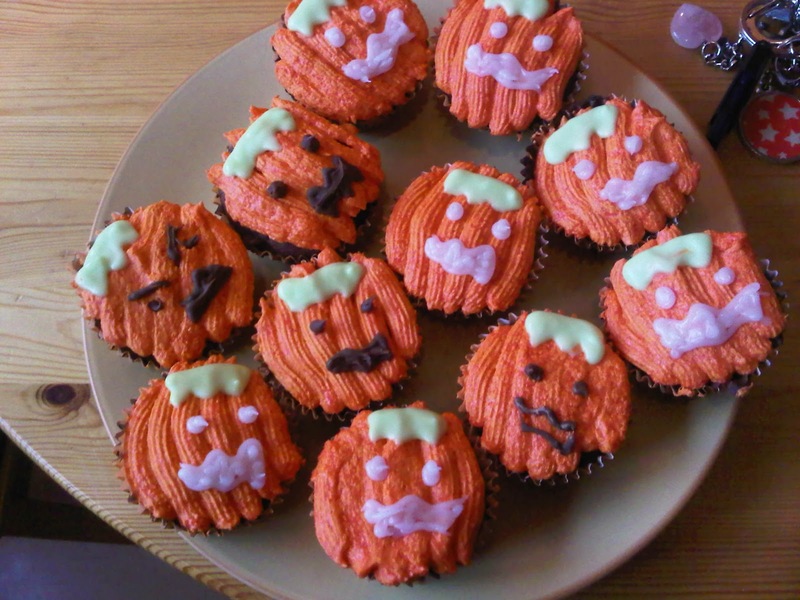 I like their faces and how you've piped on the icing to get a pumpkin texture. Fantastic - I love both designs but, having just returned from Whitby, Dracula just wins for me! Aaah I think the pumpkin cakes are cute! The texture looks great. Love the Drac ones too. Know what you mean though - if something doesn't quite go as planned it really bugs me too.